Freelance motoring journalist Johnny Tipler is an automotive historian and author based in Norwich, England. With over 30 books published on a variety of motoring topics ranging from racing cars and driver biographies, to motorcycles and commercial vehicles, Johnny spends much of his time covering historic race meetings, topical issues, and interviewing racing personalities for the international automotive media. A major contributor to the Lotus Club International magazine, interviewing well-known Lotus personalities, writing drive stories and book reviews, Johnny is also author of seven books on Lotus road and race cars. He also writes on new model launches, important historic vehicles, secondhand buying guides, specialist tuners, famous drivers and restorers, and covers a host of classic racing events like the Mille Miglia, Spa 6-Hours and Goodwood Revival. 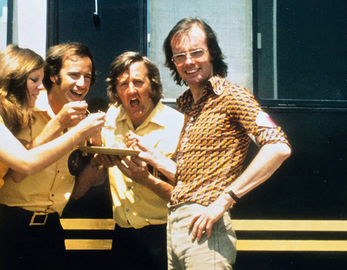 Johnny has a degree in Art History, and in the 1970s he co-ran the John Player Team Lotus press office in London, rubbing shoulders with the likes of Emerson Fittipaldi, Ronnie Peterson, Jacky Ickx and of course Colin Chapman, trumpeting the fortunes of JPS-Lotus and Player’s sponsored events around the world. The perfect background for his forthcoming book for Coterie Press, Black & Gold: The Story of the John Player Specials.